Line a lightly greased 11cm x 26cm x 7cm (2.25-litre-capacity) tin with non-stick baking paper (see cook’s tips, page 118) and freeze until ready to use. Place the raspberries and sugar in a bowl and, using a fork, crush until smooth. Place the strawberry ice-cream in the bowl of an electric mixer and beat on low speed for 1–2 minutes or until softened. Add the raspberry mixture and beat until combined. Spoon into the tin and spread evenly with a palette knife. Freeze for 2 hours or until frozen. Place the blueberry jam in a small bowl and stir well until it becomes smooth and soft. 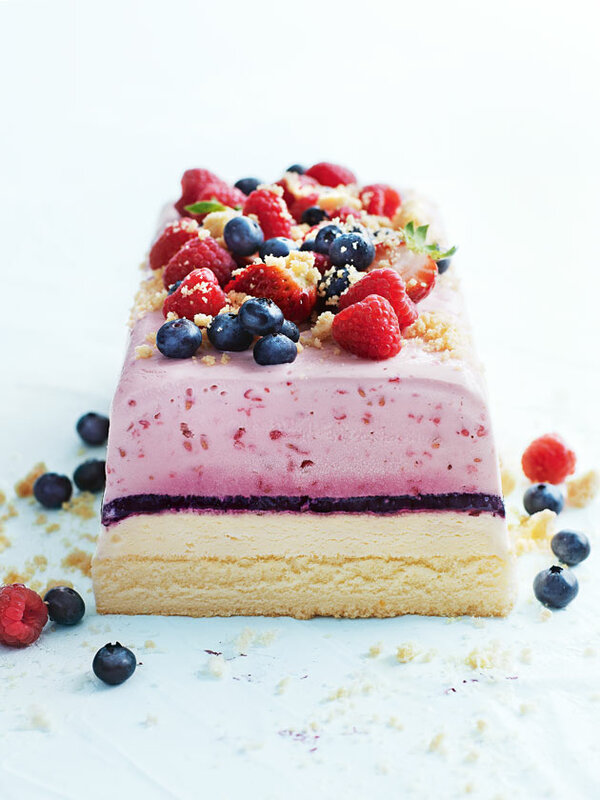 Spread the jam evenly over the berry ice-cream layer. Freeze for 1 hour or until set.